PHPP offers an accurate form of energy modelling for your building. Many people assume that the SAP assessment of their building will indicate its actual performance. This is not so. SAP is intended to verify compliance with the requirements of the Building Regulations. It is not a design tool, and does not show how the building will really perform. Common problems with SAP are that it does not give precise information on overheating risk and it does not actually predict the energy use of your building, particularly where the intention is to build to better efficiency standards than the current Building Regulations. Our service is ideal for those concerned about energy efficiency, but not intending to reach advanced energy standards, such as Passivhaus or AECB Building Standard. The service will give a good indication of the performance of your building, without the fully detailed modelling in PHPP required for those standards. * Unless you have already placed an order with us prior to us undertaking the modelling, we will ask for a £250 (+VAT) deposit, which will be discounted from your combined whole house order for Green Building Store windows/ doors and MVHR systems. The Energy Performance Modelling service is an additional service we are offering as part of our commitment to help you make your building energy efficient, and to ensure you find the appropriate product from our range for your project. The information provided in the reports is indicative only, using modelling in Design PH and PHPP. 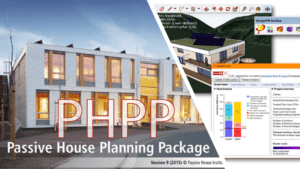 For customers wanting a full version of PHPP, to the level required by Passivhaus certification, then additional consultancy fees would apply. The information provided in our reports will be based on the accuracy of the information you have provided. The modelling will provide advice based on assumptions of different levels of airtightness.